A large and enthusiastic group of veterans, state political leaders, Fauquier County officials and others gathered at Vint Hill on Thursday afternoon for a groundbreaking ceremony for the Puller Veterans Care Center. Scheduled to open in late 2019, the 128-bed facility on 30 acres has been designed to provide high quality care for Virginia veterans in a home-like setting. Also included are spaces for physical and occupational therapy and a pharmacy. Secretary of Veterans and Defense Affairs Carlos Hopkins, a lieutenant colonel in the Virginia Army National Guard, introduced the keynote speaker, Gov. Terry R. McAuliffe. “He has never stopped working from day one that we have the most military-friendly state in the nation,” noted Hopkins. McAuliffe listed several veterans’ support programs initiated during his term, as well as now having 30 Veterans’ Service Offices throughout the commonwealth. He was especially proud that Virginia was designated the first state to be certified by the Dept. of Housing and Urban Development “…to have functionally ended veteran homelessness in our state.” So far, 3,189 homeless veterans have been moved into permanent housing, according to the governor. Congressman Robert Hurt dropped by the Mason Enterprise Center-Fauquier on August 20th for a visit with a couple of Veterans who were receiving employment counseling with Michael Barnes, a Veterans’ representative of the Virginia Employment Commission. Impressed with growth of the MEC business incubation center, Hurt also asked to revisit CoWorking, an onsite workspace for independent networking. If you know a local veteran in search of a job, there’s a unique service available. Veterans from all periods of military service are eligible for job referral, job training, and job placement assistance the through the Virginia Employment Commission (VEC). 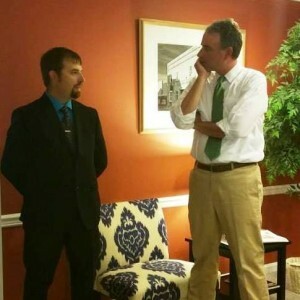 As a community outreach service, the VEC-Charlottesville Veterans’ Rep will be available at the Mason Enterprise Center (70 Main Street, Warrenton) on September 18 as well as the third Thursday of every month from 1:00-4:00 p.m. The Mason Enterprise Center in Warrenton will host a job-search program for military veterans, in a new push from Fauquier County’s government to do right by the active and retired service members who form a significant portion of the population. 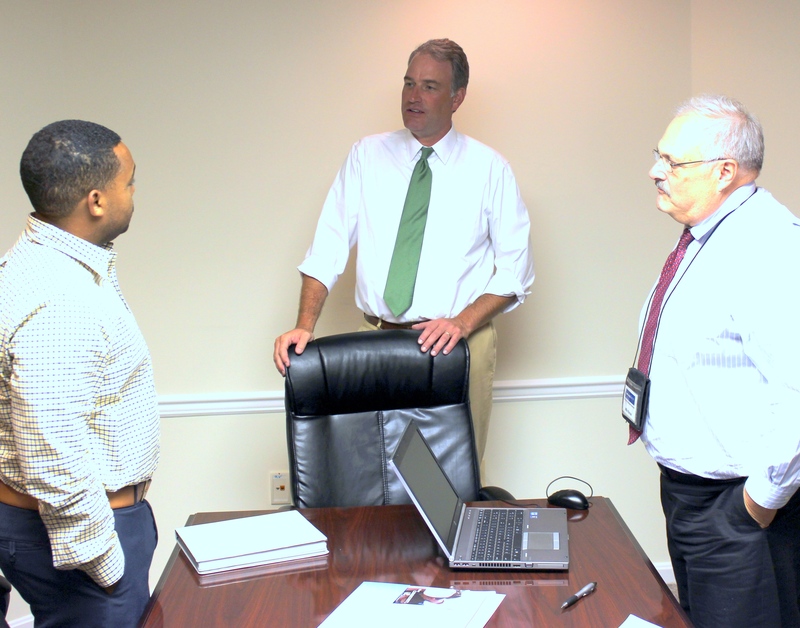 The Mason Enterprise Center program, with offices in Springfield, Fairfax, Leesburg, Manassas, and as of2013, Warrenton, has an unparallelled history of providing groundbreaking facilities and assistance to Virginia’s newest business owners. The direct result of this program: 21,000 new jobs have been created throughout the region. As George Mason’s newest business development community, the training and resources available in Warrenton through the enterprise center positions Fauquier County in an ideal posture for economic growth and opportunity. Unlike typical executive suites, the program is designed to be a true incubator. The Mason Enterprise Center business incubator in Old Town has picked up a new, high-profile occupant. Hospice of the Rapidan has opened a new location at 70 Main Street, Suite 23, to better serve residents of Fauquier and Rappahannock Counties. From this new site, hospice nurses and staff members will have easier access to local patients, hospitals, nursing homes and assisted living facilities. Hurt, who represents most of Fauquier County, was in Warrenton to visit the Mason Enterprise Center business incubator. Fauquier entrepreneurs have a new place to grow fledgling businesses. The Mason Enterprise Center opened early this month at 70 Main St. in Warrenton. Businesses in Fauquier County look like they will have a new friend in downtown Warrenton soon. On Thursday, the Fauquier County Board of Supervisors permitted the county’s Economic Development Department to negotiate a spot in the 70 Main Street building for the new Mason Enterprise Center. George Mason University could open a business incubator in Old Town Warrenton by February. Fauquier County Economic Development Director Miles Friedman will present a lease for the space to the board of supervisors Dec. 12. The Fauquier County Board of Supervisors got its first look Thursday at possible locations for the George Mason University Mason Enterprise Center. Fauquier’s supervisors this week expressed enthusiastic but guarded support for creation of a business incubator/accelerator that could represent a multimillion-dollar investment. Economic Development Director Miles Friedman outlined three options for housing the center, which the county would operate in cooperation with George Mason University. The Fauquier County Economic Development team has helped identify three potential sites in Warrenton for a new Mason Enterprise Center, according to department Director Miles Friedman. On Thursday afternoon, MEC Executive Director Keith B. Segerson and Fauquier County Economic Development Director Miles Friedman will give a presentation on the MEC to the Fauquier County Board of Supervisors.